Since October I have been living up in Nor Cal guiding Steelhead on The Trinity River just about every day. The Fishing this year has been superb! It seems that this has been the best run of fish since 2007. 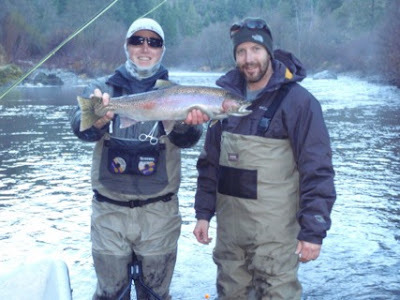 Despite having VERY little precipitation this year, the fish keep pouring in! The water conditions have been poor due to the low, clear and cold water we have had all season so far. But, as you can see from all of the photo’s below the fishing has remained very good! Overall, I have been averaging between six to ten hook-up’s a day with average client skills. Some days have been down right silly with 15 plus hook-up days! Morgan and I with one of many that day. These guys got the job done well, so did the fish! They hooked 17 that day!!! Morgan with his first of the day. John already had two to the boat before I even finished my paper work in the first 20 minutes! Here is Richard stacking a mend. This has been what the weather looks like. Wojo and I with a wild Buck. Tom and I with a big, beautiful Hen. Rick and I with a smoking hot wild Buck that jumped 11 times! Rick and I with another colored up Buck. Richard posing with one of his friends he has come to know so well. Richard with a big Buck. 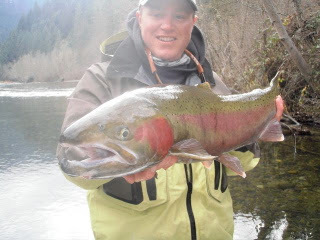 Mark with the biggest Steelhead I have ever netted on the Trinity! These photo’s don’t do the fish justice. AT ALL. But as you can see from the photo above the fish was so long, and heavy I almost dropped it while lifting it for the photo. Got to love the expression on Marks face! Good thing I didn’t drop it! The fish measured at 36″ long!!! Beautiful morning as I started another day of work at the office. Keith could only get one day in as my calendar was already full when he contacted me, so I knew we had to make the most of it. That morning he showed up with his son Robert who was throwing up from the stomach flu he had gotten the night before. We hit the water at 9:30am and and had the boat on the trailer by 3pm, as we were both traveling home for the holidays that night. Robert never made a cast as he felt too sick to move, Keith hooked 10 and landed 4, what a day! Wish they were all that easy! Keith with a big Hen. Deuce and I with a nice Buck. Wojo and Deuce with a double hook-up, but I must admit… one was an exotic (sucker) and the other was the reel deal. I have had quite a few doubles this year but yet to land both of them. Deuce with the real one. Wojo got back to fishing for the right species and left the exotics alone. Then we stuck this Buck at the next spot. His beautiful wife Jolie and I with a bright wild Hen that smoked her! 7:30am at the Trinideli. My roommates and I getting our lunches then heading to work. Jolie with a nice Hen. The fall colors were beautiful along the river. Jolie and I with a super bright and smoking hot wild Hen that jumped and ran like crazy! Jack with a big bright Hen. Jack took this shot of me making a couple of casts with one of my new Spey rods. Just missed the jump in this photo, but it’s still a cool shot of the fish blowing up the pool. 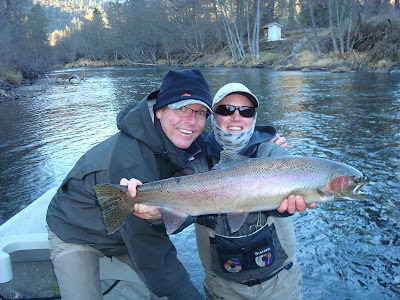 Beautiful days on a beautiful River filled with big hard pulling Steelhead! Richard out of the boat chasing down a big one! Richard with a big hefty Buck. Amro with his last Steelhead before moving to Hawaii. A good one to end on! My niebor and friend Jason with a hot Hen that jumped like crazy and had his reel singing! Richards first one of the year. By the look on his face, I think he forgot how big they are. I want to say thank you to all of you I had the pleasure of fishing with this year. I trully appreciate all of the great times and memorable experiences we shared together in 2011. I hope you are all enjoying the Hollidays with friends a family. I’m looking forward to 2012 bringing more great times on the river and growing friendships. My calendar is already filling for 2012 so dont procrastinate, get your dates booked before I fill up! Happy Holidays from Angela and myself!